I am amazed at how often bacon and candy cross paths. Candy Addict has done articles on chocolate-covered bacon, gummi bacon, and bacon jellybeans. 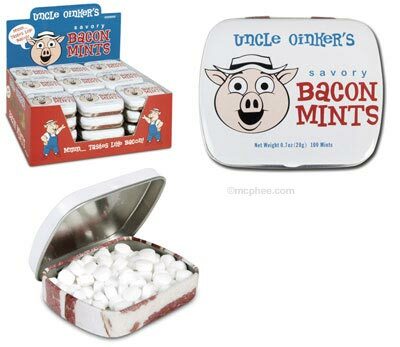 Now we can add Bacon Mints to the list. When I was offered some Bacon Mints to review, I immediately said “hell, yes!” but wondered what they would taste like. When the package arrived, it contained two tins of Bacon Mints and two tins of Bacon Flavored Toothpicks (more on those later). Opening the shipping package brought a scent to my nose that I wasn’t prepared for. It was bacony, minty, and had a smell of a hospital. The smell was odd and didn’t hit me as being an appetizing smell. I opened a tin and took a big sniff and it nearly knocked me over and I don’t mean that in a good way. It was an absolutely awful smell. It’s really hard to describe, but it’s not a smell you want to get a whiff of. At this point I wasn’t really looking forward to trying them, but reviewing candy isn’t all about tasty chocolate – sometimes you must eat some questionable candy. The mints taste as bad as I thought they would. It was maybe 30 seconds in my mouth and I had to spit it out. It was awful. It’s one of the worst tasting candies/mints I have ever had. Just thinking about it makes me nauseous. I took a tin to work to share with my co-workers too (with fair warning). I set the tin on my cabinet shelf behind me at about 8:00 AM and I could only last til 11:00AM and I had to move them to my car – the smell (even through the closed tin) was overwhelming. Nobody at work dared try them – even the guys that ate crickets with me wouldn’t try them. My sisters tried them with me one day and we all spit ours out in less than ten seconds. I just tried one more while writing this to make sure the taste was fresh in my mind and palette. Good lord they’re hideous. I’m not sure who came up with the idea of mixing mint and bacon, or who gave the final OK to start making these, but I have to question that person’s sanity. The only good use I can think of for these is hiding ten or so of these in your enemy’s workspace and watching them go crazy trying to find the source of the smell. If I haven’t convinced you not to buy these yet, two tins of 100 mints will run you $4.95. Oh – and for the record – one of my dogs ate one, the other refused. 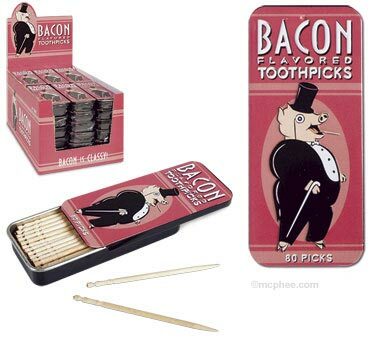 And the Bacon Flavored Toothpicks? Almost made me gag. Seriously. I have an unopened tin of the Bacon Mints and an unopened tin of the Bacon Flavored Toothpicks that I must get rid of so leave a comment on this post before Thursday, March 1, 2007 and I’ll randomly draw one of the commenters to get them – be sure and leave a real email address so we can contact you (your email won’t appear on the site). Don’t say I didn’t warn you though. UPDATE: Congratulations to Austin – he is the winner of the bacony badness! Yeeeaaahhh…. I’m gonna have to pass on that. If he won’t touch them, perhaps my dog will. My nephew would love these!!! I don’t care how terrible they might be, I need to get my hands on these in to put on display in the house of pop-culture oddities that is my home. This sounds like something my little brother would oddly enjoy. I bet you they taste like dog treats, though. He did once eat a Snausage. I can’t say he enjoyed it. I don’t think there’s a February 29th this year…. Well, people eat ham and pork chops with mint jelly, so the flavor mixture isn’t completely unknown. Still sounds disgusting, though. Don’t put me in the running for these, please! Wow, I would definatly give them a shot….worse comes to worse I take them out of the tin and leave them in the Office Candy Jar that sits near me. LET THE HILARITY ENSUE! Wow…I’d say I’d have to try them just to be able to say I have. And also to share them with my friends without telling them what they are. My breath mint has a first name… It’s O-S-C-A-R! My breath mint has a second name… It’s M-E-Y-E-R! Breath Mints & Pork should not be wed! If a choice ‘tween death or salty breath.. I’d rather be dead! Oh yeah, I want some bacony badness. Oink Oink, put me in the drawing, I would love to get my hands on these. Do you know where they are available? i really wanna try these !!! That is just. . . bizarre. Maybe they’ll keep my brother away…I definitely want to be entered. I’ve had bacon concoctions that were surprisingly tasty, but mint and bacon has never sounded good. I’ve had — and loved — bacon brittle and bacon chocolate. Wouldn’t have thought to mix mint and bacon (I thought there were still antimiscegenation laws on the books for that), but I’m so darn curious…. Darn, I’ve already ordered two packages of bacon mints for my son – before I read your review! But hey, let’s load him (and his nerdy co-workers) right up! mine came in the mail today (two tins rattling around in an unpadded box if you care about that sort of thing), and considering the odor wafting from the closed box was unappealing, I should’ve known better. But I tried one, and yes,they’re as bad as the review claims. I managed to eat an entire piece, and my mouth still has this horrid smoky aftertaste. Yes it’s a novelty candy, yes the tin is cute (I’ll keep that), but this is definitely not a product you need to sample for yourself. How disappointing- I’m Jewish. I really wanted to eat uh…. bacon mints. I’m thinking of the smell of bacon and thinking of the smell of mint and it’s making my brain cringe. Though, I guess, this would be a good way to get back at any Jew who wronged you. Or, you know, anyone who wronged you really, considering how these must smell. Seems the smell would be nauseous. ….Who’s up for beef mints?